As Fed Blows Bubbles, US Consumers Fall Further Behind, Where’s the Trickle, Ben? Wall Street pundits are only concerned with how top line retail sales did this month. In reality, they’re looking at inflation and the spending of the top 10%, not growth in the volume of sales, and not broader growth in real retail demand. With the CPI data posted today we can drill down and see how the average US consumer is doing. It looks as though he or she isn’t doing too well. The majority are buying less, not more. The idea of the “resilient US consumer” is a myth. Only the top 10% or so is resilient. The rest are running in place or losing ground. Real Retail Sales Ex Gasoline Per Capita for February 2013 totaled $596.98 in 1982 constant dollars. That was 1.7% below the year ago level. That was the second year to year decline in 3 months. December was down by 0.7%. January had an increase of 4%. One decline could be an anomaly, but twice in 3 months we need to begin to worry. On a rolling 3 month basis, the last 3 months are only 0.4% ahead of the same period a year ago, and with 2 declines in 3 months, we have to wonder if even a near zero growth rate is sustainable. This month’s decline in per capita spending was more than double the 0.7% decline in total real retail sales ex gas. Apparently the majority of Americans are losing ground faster than the top few percent is gaining. Where’s the trickle down Dr. Bernanke? The February number now stands 6.1% above the level of 3 years ago, which was the absolute bottom for this figure coming out of the recession. So there’s been some recovery. However per capita spending on everything but gas is still 5.2% below the peak February level in 2006 at the top of the bubble. It is just 1% above the level of February 2003, coming out of that recession. Even though there has been some recovery since 2010, most Americans have lost purchasing power over the past decade. The economy is technically growing but leaving most Americans falling behind. Looking at this chart and considering this data, ask yourself how the Fed’s money printing, which is probably fomenting more disastrous bubbles right now, is going to help more Americans get good paying jobs that will enable them to halt the long term slide in their standard of living. The last bubble did not do that. In fact, it made things worse for most Americans. Only the speculators and crooks at the heart of the easy money driven Ponzi scheme did better. Everyone else simply tread water through the bubble. When it collapsed, they did worse. And they have not caught up during the recovery phase. Meanwhile surging gasoline prices are cutting into consumers’ discretionary spending on other things. The Fed wants credit for rising stock prices and housing prices, but will accept no responsibility for the rise in energy prices that is crushing most middle class consumers. Why would the Fed expect the effects of the the bubbles it is blowing now to be any different than in the past? This is one definition of insanity. 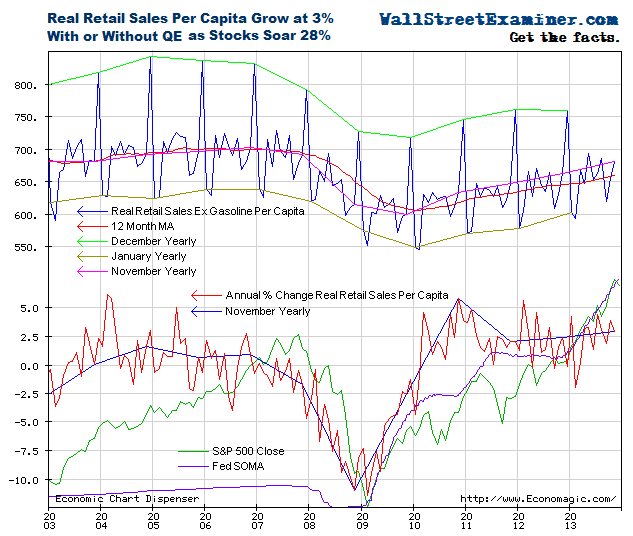 This report is excerpted from the permanent charts page on Real Retail Sales. Follow my comments on the markets and economy in real time @Lee_Adler on Twitter! Stay up to date with the machinations of the Fed, Treasury, Primary Dealers and foreign central banks in the US market, along with regular updates of the US housing market, in the Fed Report in the Professional Edition, Money Liquidity, and Real Estate Package. Try it risk free for 30 days. Don’t miss another day. Get the research and analysis you need to understand these critical forces. Be prepared. Stay ahead of the herd. Click this link and begin your risk free trial NOW! Get a “heads up” on these lively, informative commentaries on the latest economic and financial data. You will receive one or more free e-letters each week featuring an excerpt from a current Wall Street Examiner Professional Edition report or from an exclusive report on current economic data releases to help you to cut through the media spin and give you a clear picture of what’s happening in the markets and the economy. Thanks for joining me in the search for reason and clarity in this treacherous environment! The story and its charts are indeed telling. They are the results of things that have happened and are happening. Somehow, they are supposed to inform our actions to improve our lot in what lies ahead. There’s a certain key component, maybe THE critical component, of our national economy that points the way forward. The critical component today is spending per consumer. Progress can only come about for the many by increasing spending per consumer. It’s not just because we have a theoretical consumer-centric economy. But, importantly, that is the outcome we are seeking, and we should look at monetary policy transmission vehicles that can result in an increase in consumer spending. There is only one major, but not insurmountable, obstacle to that progress. Because we have a debt-based system of money, we cannot obtain the money for more consumer spending without increasing debt. Catch 22. The lenders are in charge. The solution is the end of the debt-based system of money. Without that systemic change, the numbers that tell us where we’ve been will pass trough the worst of times. The Kucinich Bill ends the debt-based system of money. And provides the vehicle for increased consumer spending.